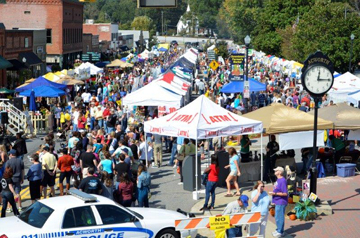 The Annual Taste of Acworth will take place in the Historic District of Acworth, on Main Street, Saturday, October 11th from 10:00 a.m. – 6:00 p.m. Acworth Business Association and the City of Acworth sponsor this coveted event every year that benefits numerous local schools and charities in our community. Approximately 20,000 visitors tasted their way through this collection of delicacies last year and it is expected to evolve tremendously this year. The festivities will allow 150 booths from local restaurants and businesses demonstrate what they do best. There will be two live entertainment stages providing live music and demonstrations from local talent throughout the day. The infamous dog show is scheduled at 3:00pm and a fun fashion show at noon. Children will have plenty to do with inflatables, quad bungee, and challenging games located in the kid zone. And new this year is the High School Team Culinary Cooking Challenge. Restaurants include Henry’s Louisiana Grill (Yeah baby! ), Center Street Tavern, Dogwood Terrace. Joe’s Crab Shack, Capo’s NY Pizza, Marietta Fish Market and many more. Admission is FREE! An array of diverse restaurants will be offering food samples from $1:00 to $4.00 to satisfy every palate. Parking will be available throughout town at McCall Primary School , Acworth Methodist Church , and Acworth First Baptist Church. Come hungry, bring the kids, bring the pooch, and join in the fun!